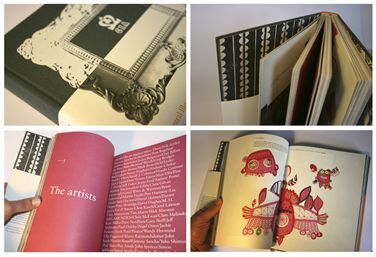 The Central Illustration Agency have just published this beautiful book showcasing all their artists. And I never thought I would be able to say 'I'm one of them'. That's not some special faux-blog-modesty talking there. Nope, I mean it. I mean it because CIA represent some serious time-served people I admire and look up to as masters of their art - Peter Horridge, Sir Peter Blake, Andrew Bannecker, Paul Slater, David Hughes, Jeff Nishinaka to name a handful. I also say it earnestly because I've happily put in the hours, grafting away at a job I love for many years, to get to the stage where I might be able to sit in the company of these artists, and the relationship I have with Ben, Jules, Rhiannon and Alicja is rather special to me. Long may it continue! License To Inspire is an eclectic mix of stunning artwork and fascinating interviews from the world's most talented illustrators and industry innovators. An invaluable resource for art buyers and other professionals within the creative industries, this will soon become a recommended text for art students and particularly those who wish to work in the industry. With inclusions from a diverse range of artists from Jonas Bergstrand to Sir Peter Blake, the book is packed with beautiful images and thought-provoking words. Created by the acclaimed Central Illustration Agency, who have been associated with the brightest talent in illustrative art since 1983, this book will be an essential addition to any coffee table or agency library. "Illustration has been arguably the liveliest art form of this decade, and CIA have been right in the centre of it. This book paints a brilliant and lively portrait of the world, the art and the business of contemporary illustration." Marc Valli, Elephant magazine & Magma. You can buy a copy on CIA's website. or from the ever-reliable Amazon.